Get back that youthful skin with our Bio-Hydrate Line ! 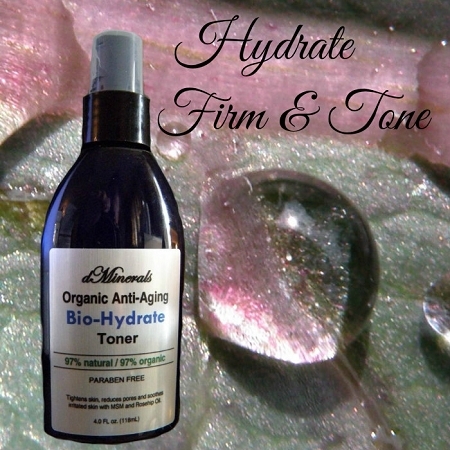 dMinerals ORGANIC ANTI-AGING BIO-HYDRATE TONER Will help maintain the integrity of the ph mantle of your skin, an important step in proper hydration and restoration. This unique formulation incorporates amino acids to rebuild a weakened cellular matrix, soothing and calming botanicals help to open pores to receive the active ingredients. Organic msm delivers polysaccharides and antioxidants deeply into the heart of your skin cells. 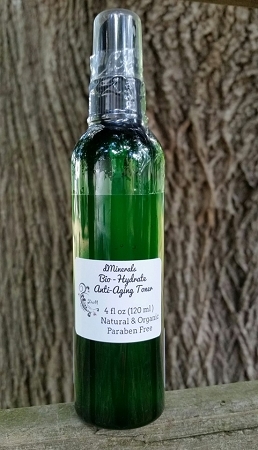 Pure cold-pressed plant oils along with hyaluronic acid firm up and tone the skins surface. To Use: This toner is thicker than most! A little goes a long way! Place a small amount into the palm of your hand or cotton ball. Apply after washing with your Organic Bio-hydrate Cleanser. Allow to dry before applying your moisturizer. Ingredients: Organic Herbal Infusion, Organic Aloe Vera, Geranium Distillate, Witch Hazel, Amino Acid Blend (Sodium L-Pyrrolidone Carboxylate, Sodium Lactate, L’Arginine, L-Aspartic Acid,L-Pyrrolidonecarboxylic Acid, Glycine, L-Alanine, L-Serine, L-Valine, L-Proline, L-threonine, L-Isoleucine, L-Histidine, L-Phenylalanine), Methylsulfonylmethane (MSM), Organic Rose Hip Oil, Hyaluronic Acid, Organic Oat, Frankincense Essential Oil, Organic Jojoba Oil, Organic Rosemary, Organic Chamomile, Tea Tree Oil, Organic Calendula Oil, Organic Green/White Tea, Carbomer,(2s)-2-Amino-5-guanidinopentanoic Acid, Retinyl Palmitate (Vitamin A), Vitamin E Tocopheryl,Ethylhexyl Glycerin, Phenoxyethanol. This toner makes my face and skin feel refreshed.